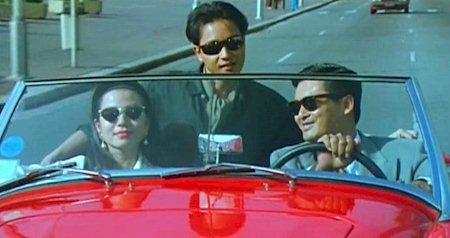 Cherie Chung, Leslie Cheung and Chow Yun-Fat take in the sights. The Skinny: Popular John Woo-directed comedy has style and charisma to spare thanks to its peerless trio of stars: Chow Yun-Fat, Cherie Chung and Leslie Cheung. The film itself is a mixed bag of bizarre comedy, kid-friendly action and uneven plot shifts. A good time can be had, but is the movie really that good? For die-hard fans of The Killer and Hard Boiled, this action-comedy can be baffling. He eschews his trademark blood-soaked brotherhood for sunny locations, oddball comedy and (gasp!) a love triangle. Chow Yun-Fat, Cherie Chung and Leslie Cheung play three orphans who grew up together under the auspices of adopted father Kenneth Tsang Kong. Tsang also taught them how to be theives, and despite falling in with kindly cop Paul Chu Kong, the three grew up to be high-tech, high-stakes art thieves who terrorize the French Riveria and, presumably, museum curators everywhere. Chow eventually wants to leave the life, but their final score goes awry when a double-cross occurs. Chow appears to perish in a car accident, and Cherie is heartbroken at losing her lover. Still, Leslie and Cherie must go on without Chow, and eventually begin their own romantic liason. Big surprise: Chow survived, though he's now confined to wheelchair. Despite that setback, and the newly-complicated romantic tension, the trio go about planning a new heist, though things aren't what they appear to be. Since this is a John Woo film, there is some gunplay, but it's remarkably bloodless and kid-friendly. There are some nice acrobatics and slow-motion, but the usual shots of bullets ripping through bodies are gone. Instead, we get shots of Leslie Cheung's hair flowing in slow-motion, or Chow Yun-Fat making fart jokes. Yep, there's comedy aplenty in this John Woo flick, and a lot of it simply makes no sense at all. During a heist, Chow and Leslie do a limbo underneath a laser security beam. Why? No reason at all. Stephen Chow would be proud. With the abundance of strange comedy, this film can be as alienating as they come. However, Woo makes sure to provide his usual melodrama and well-choreographed set pieces (the heist scenes are actually not bad), and his suggestive homoeroticism doesn't get ignored, either. Woo throws in something for everyone, but the result is uneven and filled with ill-fitting variety. It's like your typical Lunar New Year comedy. Or a salad.